The LAMBDA MINIFOR bench-top laboratory fermenter and bioreactor was developed as a result of the need to construct a small laboratory fermentor for volumes from 35ml up to 6 liters. Based on long personal practical experience of fermentations we wanted to create a fermentor, which was easy to use and with the capacity to measure and control all the important parameters of the biological culture. The fermentor had to take up minimum space on the bench but with good access to all parts. Several fermentors should when placed side by side be suitable for the optimization of the parameters of growth of culture or optimization of bio-transformations etc. Each fermentor should be able to work independently or be connected to a PC for advanced regulation and extensive data treatment. The agitating discs of the 'fish-tail' bioagitator are elastic and have the typical form of fish tails. In analogy to a fish tail, this shape of the stirring disc produces an efficient energy transfer in liquid (culture medium). produce a unique Bio-mimicking "Fish-tail" bioagitator ...Move it like a fish! Have you ever seen a fish moving with a propeller instead of a tail? Bioagitator - An optimal choice for cell culture. Gentle and efficient mixing in both horizontal and vertical direction. No cutting edges and no eddies or turbulence formed during the agitation. Efficient medium circulation with the up and down movement of the fish-tail discs, Cells are not broken or destroyed due to the hydrodynamic shear stress. Optimal oxygenation and gas exchange in the medium (no air flooding). MINIFOR - only reactor for all types of cultures. Bioreactor: Because of no shear stress, MINIFOR is suitable for Mammalian cells, insect cells, cancer cells and stem cells. Fermentor: Because of high oxygen transfer rate and efficient mixing, MINIFOR is effective for high cell density fermentation like highly viscous fungi and bacterial cultures. Photo bioreactor: LUMO - light control with selectable wavelength adjustable light intensity for a compact lighting controlled directly by the bioreactor. This makes it suitable for algal cultivation. Only reactor where user can change the working volume from 35mL to 6 Liter. Because of its unique Up and Down agitation, there is no chance to generate shear stress. At the same time the efficient mixing reaches up to 20 Hz (1200 rpm). The very expensive, clumsy and complex to set up traditional metal head plates were completely eliminated and replaced by new threaded glass vessels, which make ports manipulation as easy as screwing a cap on a bottle! The LAMBDA fermentation vessel has one central neck with large threads for fast and reliable fixing of the agitating and aeration system. This can be easily done just with one hand. Eight additional threaded necks are distributed around the side of the vessel (7 small necks and 1 larger neck for quadruple sampling and addition ports) - all well accessible from all sides. The vessel is heated from underneath by infrared radiation generated by a spiral heater of high heating power but very low heat capacity. Heat rays are concentrated by the gilded parabolic reflector with 98 % efficiency onto the bottom of the vessel, where about 50% is absorbed by the glass and about 50% is absorbed directly by medium. The result is an extremely soft heating without any hot spots, not even at lowest medium levels. Natural thermal convection takes place even without any mixing of the culture. This novel heating system is also very convenient, because cables, tubing, connectors, the necessity of heating blankets or jacketed vessels and circulating water supplies are completely eliminated. This new system outperforms all other heating systems. LAMBDA introduces a self-cleaning micro-sparger, which due to its elasticity does release any deposits formed on the sparger holes and thus guarantees gas inflow at all times. The LAMBDA microsparger can never be blocked even during very long continuous runs! The sparger is made of special silicone with miniature openings. The elasticity of the material closes the openings when no air passes through. Under the air pressure, these pores open and let the air bubbles form. The medium deposits also form here. This is an inevitable physical process. However, when the deposit accumulates and starts obstructing the air flow the resulting higher air pressure forces the elastic pores to open and thereby the deposit is released into medium.The air passage is free again. Based on long personal practical experience with fermentation and cell culture, we have designed an easy to use system with the capacity to measure and control all the important parameters of the biological culture. The fermentor have to take up minimum space on the bench but with good access to all parts. Several fermentors should, when placed side by side, be suitable for the optimization of the parameters of growth of culture or optimization of bio-transformations etc. Instead of a fermentor flask with a stainless steel cover, which is expensive, we use whole glass vessels with threaded fittings. They have been used for many years in cell culture and are proved to maintain perfect sterility. 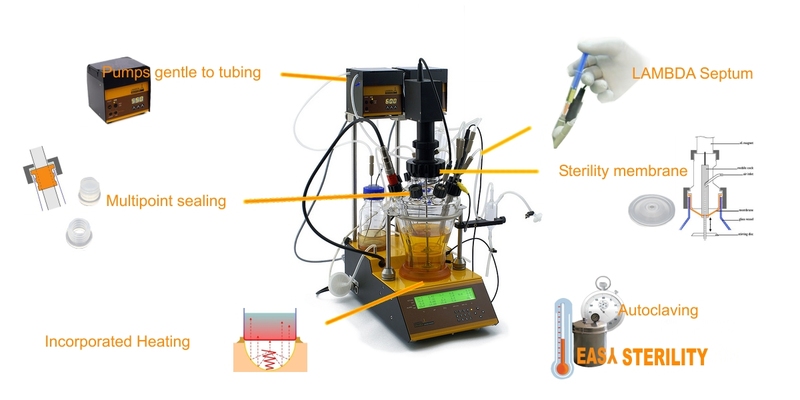 Thanks to this concept, the MINIFOR fermenter-bioreactor is set up in shortest possible time. The culture is heated by heat radiation produced in a parabolic radiator with a gold reflector placed under the fermentation vessel. The heat is absorbed gently in the culture similarly to the sun heating water. There is no overheating of the culture at any volume and expensive double-wall vessels with thermostatic baths are eliminated. At the same time tubing and cables disappear making the fermentor less complex. Instead of a traditional propeller agitator, which requires an expensive motor and magnetic coupling, we have introduced a new up-and-down agitation. A motor together with an inexpensive membrane perfectly assure sterility and produce an efficient mixing without formation of a vortex (no baffles needed). At the same time this type of mixing is gentler on cells and produces less foam. Novel bio-mimicking “fish-tail” stirring discs offer maximum mixing efficiency without cutting edges.As far as possible expensive pieces of equipment have been replaced by new high performance plastics. A new head plate is necessary for each vessel of different volume which leads to high additional costs.Threads of ports in head plates are shallow. This, together with the well-known o-ring flattening after sterilization, leads to contaminations. Only fermentor/bioreactor where user can change the working volume from 35mL to 6 Liter. In MINIFOR a higher volume of sample can be withdrawn without any effect on the quality of regulation to increase productivity continuous cultures are possible. A scale adaptor allows weighing of the fermentor. It is simply placed under the front part of the fermentor body and connected to the X-channel input of the fermentor. By means of a pump connected to the ”Pump X”-socket of the fermentor, the weight (volume) of the culture can be kept constant. This function is included in the start-up kit already. This allows the running of continuous cultures at low cost. LAMBDA REDOX allows the measurement of the Red-Ox potential and the digital transfer of the data to the PC through its RS-485 interface. The measured data can be visualized and recorded for example by the fermentation software SIAM. 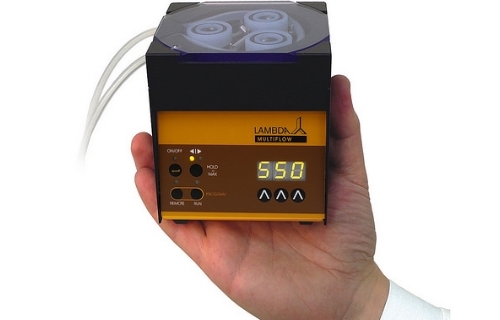 The measurement of Red-Ox potential can be made with the laboratory fermenter-bioreactor LAMBDA MINIFOR, using a sterilizable combined pH/temperature probe with an additional Pt electrode fixed on its glass body. This probe is connected to the MINIFOR fermenter-bioreactor in the same way as the standard pH probe. It does not require any additional connector, cable or side neck. However, the MINIFOR fermenter-bioreactor must have been equipped with the redox option in advance. The output RedOx signal is then provided on the “PUMP” socket at the rear side of the MINIFOR laboratory fermentor-bioreactor base unit. Cooling with this device is based on the electronic cooling effect produced by the flow of electric current through a Peltier cell. The Peltier cell allows cooling of the medium without the necessity of other means such as a refrigerating compressor or cooling water baths. LAMBDA has selected a cooling loop working according to the "heat pipe" principle, which has an advantage of having up to 80 times higher heat conduction compared to copper and can be used with various levels of medium. It works even when the loop is not entirely submerged in the medium. The LAMBDA Peltier cooling system is extremely compact and advantageous when cultures should be run at temperatures close to room temperature or a few degrees below room temperature. Lower temperatures can be achieved by isolation of the vessel with convenient isolating material. The LAMBDA Peltier cooling loop eliminates the need of refrigerated circulating baths, which are expensive and take a lot of valuable bench surface. Combined with the infrared-heating system of the MINIFOR bioreactor unit it offers very precise temperature control of the cell culture. 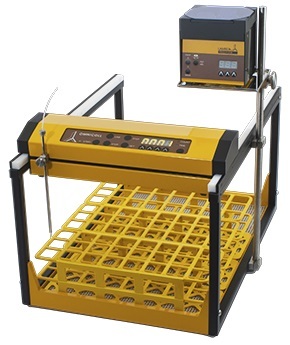 A very compact control system, which will allow good measurement and control of all important parameters by the same unit, is preferable for the user. Living organisms are extremely complex and it is desirable to measure and control as many parameters as possible. This will help to identify problems when they possibly arise. Therefore, we decided to measure and control the five most important parameters: temperature, pH, pO2, air flow rate and stirring. In addition, we wanted to provide the option of controlling one supplementary parameter such as weight, glucose concentration, conductivity, redox potential, optical density (OD) and the like. For this reason, one selectable and controllable parameter "X" has been included. All readings can be seen at a glance without the necessity of scrolling or selecting menus. The quality of regulation especially in PID controllers depends on the right setting of constants. From experience we know, that only few users know how to set these parameters properly. LAMBDA therefore leaves this task to the microprocessor which monitors what is going on in the current process and sets the right constants continuously. The working volume is recognized from the heating response on medium temperature and the most appropriate parameter setting is made automatically. To spare the space around bioreactor vessels, LAMBDA has developed the smallest anti-foam control system consisting of a miniature foam detector ANTIFO and a subminiature syringe pump DOZITO. The LAMBDA INTEGRATOR allows a simple and precise integration of the amount of liquid delivered by the pumps or gas delivered by the MASSFLOW gas flow controller. The electric impulses moving the stepping motor are registered and transformed into a direct current. The resulting voltage can then be measured and recorded. This data yields important information about the culture growth, its kinetics and time of completion. Multitalented Fraction collector with unlimited functions for chromotograhic application and autosampling. Fraction collection and dispense in lines,zigzag or meander. Fraction dispense and sampling with multichannel pumps.